'Halo In Peach' (O. David Niswonger, R. 1998). Seedling# 20-95. TB, 32" (81 cm), Midseason bloom. Standards and style arms peach; falls white, peach marginal band; beards tangerine. 'Halo in Rosewood' X seedling# 35-92: ('Nefertiti's Daughter' x seedling# 39-88: ('Halo in Yellow' x 'Peach Band')). Cape Iris 1998. Prize winner of Moscow International TB Iris Competition 2001 (second place). From AIS Bulletin #309 April 1998 Introducing HALO IN PEACH (Niswonger '98) Sdlg. 20-95: Halo In Rosewood X 35-92 ((Nefertiti's Daughter x 39-88: (Halo In Yellow x Peach Band)). TB, 32" (81 cm), M. The stds. and style arms are peach and the wide falls are white with a marginal band of peach. The large beard is tangerine. $40.00. 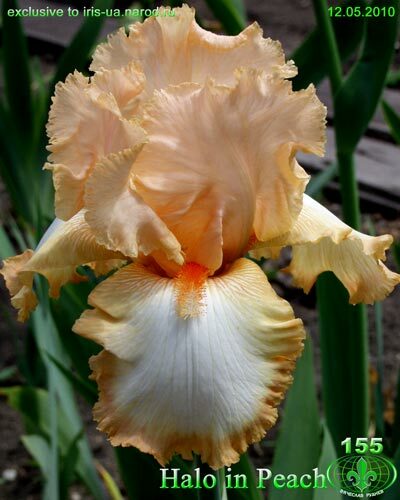 Cape Iris.